DeMarcus Cousins made two tie-breaking free throws after retrieving a Kevin Durant missed 3-pointer with 5.4 seconds remaining Sunday night, allowing the Golden State Warriors to survive a 3-point-shooting assault by the Miami Heat for a 120-118 victory in Oakland, Calif. The game marked the final Oakland appearance by Heat standout Dwyane Wade, who contributed 10 points, six rebounds and nine assists to a remarkable Heat effort. Miami trailed 107-99 with 5:34 to go before rallying into a 116-115 lead on a Wade steal and hoop with 54.8 seconds remaining. 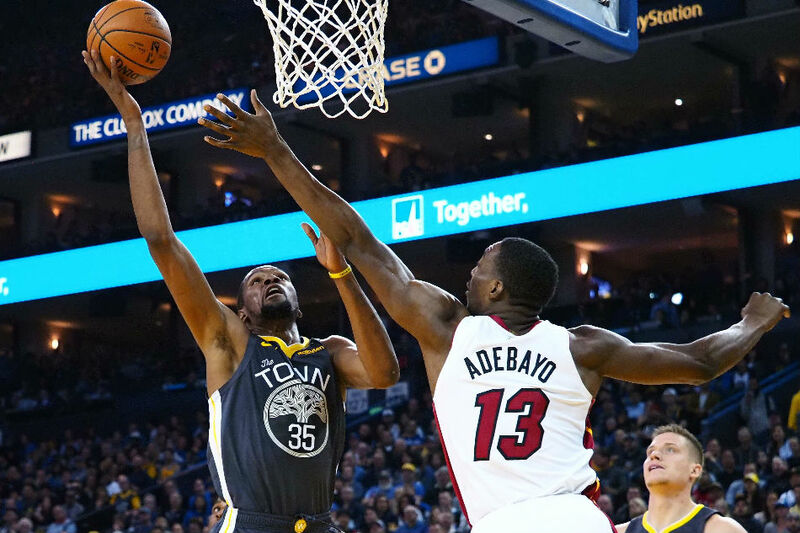 Josh Richardson made it a three-point lead with a steal and hoop of his own with 51.5 seconds left before Durant capped a 39-point night with a game-tying 3-pointer. After Justise Winslow missed a 3-pointer for Miami, Durant misfired from 26 feet at the Golden State end. But Cousins was able to corral the rebound, after which he was fouled and made the game-winning free throws. Dion Waiters took a shot at a win with a buzzer-beating 3-point attempt for Miami, but it was off the mark, allowing Golden State to win for the 15th time in its last 16 games. Klay Thompson backed Durant with 29 points and Stephen Curry had 25 for Golden State, which won its fourth straight. Draymond Green had a game-high 14 assists for the Warriors. Richardson recorded season-highs in points with 37 and 3-pointers with eight for the Heat, which was coming off a narrow loss at Sacramento on Friday. Waiters also had season-bests in points (24) and 3-pointers (six) for the Heat, the only team in the league with a winning record on the road and a losing record at home. Miami made 18 3-pointers, outscoring the Warriors 54-39 from beyond the 3-point arc. Down by five at halftime and seven in the second minute of the third quarter, the Warriors got their offense in gear. Durant (14 points), Curry (10) and Thompson (six) combined for 30 third-quarter points, pushing Golden State into a 90-82 lead by period's end. Thompson's 20-footer kept the Warriors' lead at eight, 104-96, with 6:07 to go before Miami rallied. The Heat, which entered the game having averaged just 11.5 made 3-pointers per game, bombed in 11 in the first half alone, enough to lead by as many as 19 points and still lead 59-54 at the break. Richardson had five 3-pointers and Waiters four in the half.